Last week I had the privilege of attending the Business and Economics Committee Meeting of the American Chamber of Commerce in Thailand. Jack Sheehan, Partner at DFDL, and Steven Carey, MD of Quantera Global, gave a very interesting and informative presentation about BEPS. 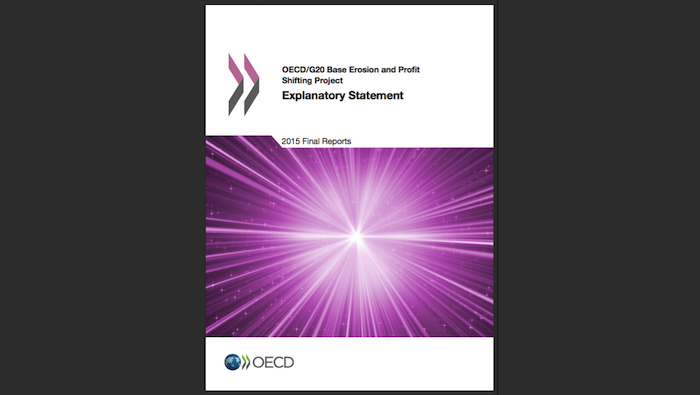 Until very recently, I have heard almost nothing about the OECD BEPS initiative. BEPS stands for “Base Erosion and Profit Shifting” and it is basically an action plan to address aggressive transfer pricing (or perhaps more accurately described as “Transfer Mis-Pricing”) by multinational organizations to minimize or avoid taxation. When companies conduct business across multiple jurisdictions, they frequently supply products or services to related entities. This creates opportunities for both double taxation of profits and also opportunities to shift profits between the related entities. Ideally, each company would honestly value products and services based on classical “arms-length” transfer pricing standards. This would allow profits to be earned by each entity in the jurisdiction where the profits are actually generated, and pay taxes on those profits accordingly. However, it is becoming increasingly common for companies to adjust the pricing of products and services to shift profit from entities or jurisdictions with a high tax burden to an entity or jurisdiction with a low or no tax burden. Several companies, including Starbucks, Amazon, and Google, have recently been accused of aggressively implementing transfer pricing based profit shifting activities to avoid taxation on massive global earnings. Dual tax treaties have been negotiated between many countries to protect companies and individuals from being double taxed on income arising from various types of cross border transactions. However, companies are now aggressively pursuing various loopholes and strategies to achieve “double non-taxation” on income, leveraging rules intended to protect them from double taxation on such income. In early October 2015, the Organization for Economic Co-operation and Development (OECD) published its detailed 15 step plan to reform the system of international taxation. This plan, which is expected to be implemented by members nations of the OECD and other national jurisdictions starting in 2016, is potentially the most significant revision to the international system of taxation since the 1920’s. One of the primary reforms proposed by the BEPS ties revenue recognition and profit more closely to real economic activity. This proposal is similar to the system of formulary apportionment, the kind of system used by the USA to tax corporations at the state level. Thailand has also been closely monitoring Transfer Pricing issues, and in May 2015 issued a new Draft Transfer Pricing Act. This act will amend the Thai Revenue Code to implement measures to prevent tax evasion through the use of transfer pricing schemes. The Draft Transfer Pricing act has been approved by the Thai Cabinet and is expected to be enacted by late 2015 or during the first quarter of 2016. Under the new Act, firms having related party transactions will be required to prepare and submit transfer pricing documentation. Such documentation must be submitted within 150 days of the end of an accounting period. Failure to submit transfer pricing documentation will be subject to a penalty of THB 400,000. Transfer Pricing investigations are reportedly a top Thai government agenda, following the pace of other ASEAN countries. The Thai Revenue Department is also devoting more staff resources to Transfer Pricing investigations. The Thai Government is reportedly closely monitoring and reviewing the BEPS recommendations. The Chinese government strongly backs the OECD BEPS proposals, but China is reportedly staking out its own proposals in a few specific areas in a bid to capture more taxes. Many Thailand based companies, especially Thailand based subsidiaries of multinational companies, will fall under the jurisdiction of the new Transfer Pricing act, and will also likely be impacted when the BEPS rules are implemented and incorporated into existing Dual Tax Treaties. All Managers and Directors of such Thailand based companies should diligently review their exposure to Transfer Pricing related issues, and implement prudent measures to ensure compliance with Transfer Pricing rules. It is a privilege to do business in Thailand, serve the Thailand community, and to earn profit from our Thailand based activities. Paying fair taxes in Thailand on profits derived from Thailand based activities is the honorable and just behavior of any responsible Thailand based entity, organization, or individual. On Thursday 15 October 2015 I had the privilege of attending “Thailand’s 6th National Conference on Collective Action against Corruption”. 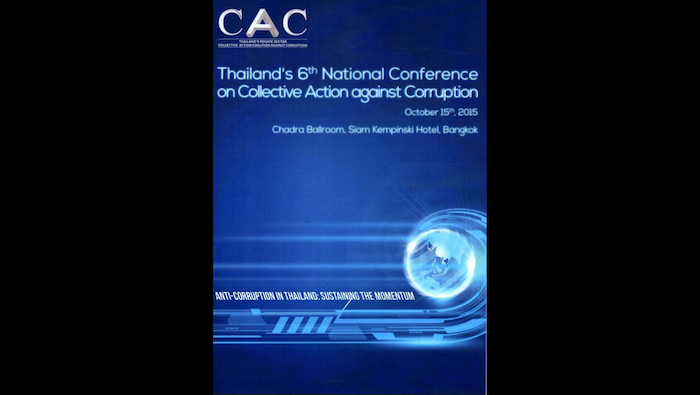 This conference was organized by the Thai CAC, formally known as “Thailand’s Private Sector Collective Action against Corruption”. The Thai CAC was co-founded by eight of Thailand’s leading private sector organizations: the Thai Chamber of Commerce, the Joint Foreign Chambers of Commerce in Thailand, the Thai Listed Companies Association, the Federation of Thai Industries, the Federation of Thai Capital Market Organizations, the Thai Bankers’ Association, the Tourism Council of Thailand, and the Thai Institute of Directors (Thai IOD). The Thai IOD serves as the secretariat of the Thai CAC and takes a leading role in driving the program. 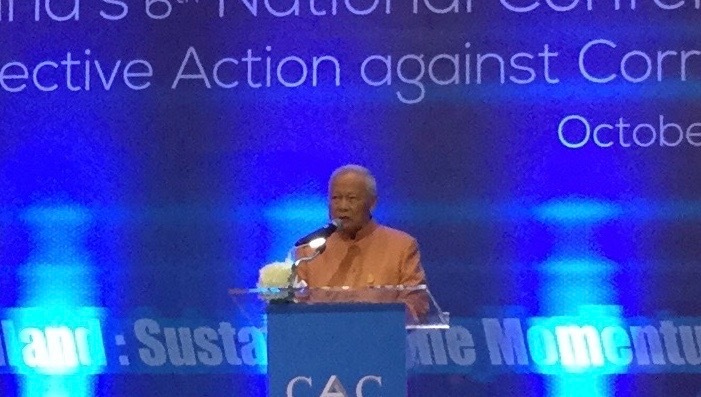 Currently the Thai CAC has 521″Signatory Companies” which have signed a “Declaration of Intent”, and 122 Certified Companies who have implemented and audited anti-corruption programs. I strongly encourage both Thai-owned and Foreign-owned companies operating in Thailand to join the Thai CAC and complete the certification process. Fighting corruption is a difficult task, and very few companies successfully escape the cruel sting of corrupt acts. Yes, your company may successfully avoid corrupt acts such as facilitation payments to government officials. However, your company is still subject to internal corruption, such as kickbacks to purchasing officers, kickbacks to maintenance personnel, fraudulent invoices, etc. A well designed, communicated, and enforced anti-corruption program acts as a vaccination to inoculate a company against infection by corrupt influences. Sounds dramatic … but I firmly believe it. The managers of foreign-owned companies often tell me that they already have compliance programs in place for FCPA (the US Foreign Corrupt Practices Act) and UKBA (the UK Bribery Act). I don’t disagree that compliance with FCPA and UKBA is important. However, I also remind these companies that they are operating in Thailand, which has a very strong cultural identity. Thailand is proud to have never been colonized, and correctly believes that its culture is unique and valuable. Adopting and complying with a Thailand based anti-corruption initiative is a far more powerful motivating force than asserting compliance with a foreign initiative, which has the effect of imposing foreign laws upon Thai nationals and organizations. Corruption is a difficult problem to solve. No single tool will be sufficient to fix this problem; a full toolbox of powerful tools, and the skill and experience to use them, will be required to eliminate corruption. Join the Thai CAC, become a signatory, and diligently work towards CAC certification. Your company, as well as our Thai community, will benefit greatly from this anti-corruption initiative. I was inspired to read this book as part of my continuing education in Corporate Governance and Directorship. I was quite interested in learning more about about Financial Statement Fraud, but was worried that this topic would not be terribly exciting to read. I decided to first read “The Martian” by Andy Weir, with the personal commitment that I would explore Financial Statement Fraud as soon as I finished exploring Mars with Mark Watney. I found “The Martian” to be thoroughly enjoyable, exciting, and suspenseful; three adjectives which I doubted would apply to Mayur Joshi’s book. “Redflags of Financial Statement Frauds” proved to be quite interesting and not too difficult to read. It certainly wasn’t as exciting as “The Martian”, but Joshi did a decent job of discussing different types of Financial Fraud and the signals that Auditors should watch for which might indicate fraudulent activities or intent. Joshi actually wrote this book specifically for Indian Auditors. I was pleased to see a non-western perspective on Accounting and Auditing. I’m confident that Indian accountants and managers are no less creative than their western counterparts when it comes to “cooking the books”. At times I did find the English grammar and composition to be a bit “unusual”. I think it would be unfair and perhaps inaccurate to accuse Joshi of poor grammar. However, Indian English is certainly a bit different than British, Australian, or American English. “Redflags of Financial Statement Frauds” is only 80 pages long (based on my iBooks page formatting preferences). Thus, Joshi doesn’t waste any time or text on unnecessarily long explanations. This book is very direct, and each topic is introduced and explained as briefly and succinctly as possible. I found this approach to nicely satisfy my immediate expectations. It wasn’t my desire to become an expert on Financial Statement Fraud, but I did want to learn more about typical types of such fraud, and the warning signs of fraudulent activities and intent. At times I did find myself wishing that Joshi had added a bit more detail or provided better examples of fraudulent entries. 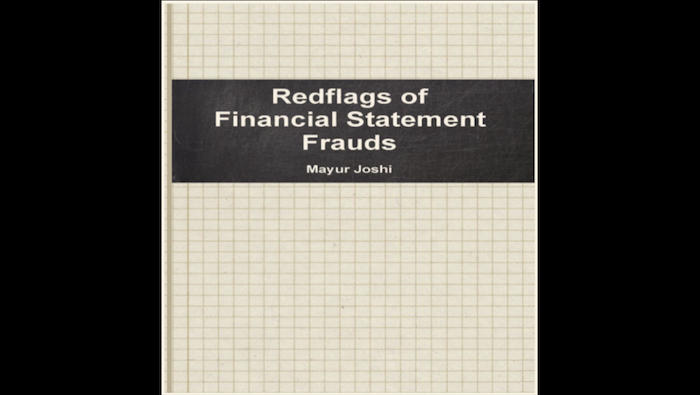 Clearly, it wasn’t Joshi’s intent for his book to be a handbook on best practices for committing Financial Statement fraud. However, I think he could have been a bit more generous with details, and I think this would have made the book both more interesting as well as informative. In the chapter on “Improper Asset Valuations”, Joshi writes that “Profits can be inflated by increasing asset values.” I found this to be an interesting statement, and spent quite a bit of time trying to figure out how this could be possible. After some thought, I realized that profits can be increased by booking expenses as assets. These “expense assets” are then depreciated over several accounting periods instead of being immediately recognized, thereby increasing profit. This is one of many occasions when I would have preferred Joshi to have offered more detail to better explain the process of fraudulent accounting entries. “Redflags of Financial Statement Frauds” is a short, inexpensive book which I would recommend to non-accounting professionals interested in Accounting Fraud. Though I do not recommend this book for accounting professionals, I must also advise that familiarity with basic accounting practices and terminology is a minimum requirement to appreciate this book. I trust that the people who follow my posts are only interested in discovering and preventing fraud, as opposed to best practices for successfully committing fraud. I truly believe that “The Essential Drucker” is one of the best business books I have ever read. Management is a very diverse discipline, though the science of management is surprisingly recent. Modern management practices were only first employed by US and UK manufacturing firms during the period 1885 to 1910, and gained a degree of acceptance during the 1920s and 1930s. Drucker, who earned a Doctorate in International Law and Public Law in 1931, began his business consulting career in 1934 in the USA, literally at the dawn of modern business management. For 71 years, from 1934 until his death in 2005, Drucker’s lifelong pursuit was the theory and practice of management. “The Essential Drucker” is a compilation of excerpts from many of Drucker’s books, publications, and articles. Drucker was a prolific writer, publishing 36 books on Management, two novels, and an autobiography. He also published numerous articles for a variety of leading business and economic papers and journals. 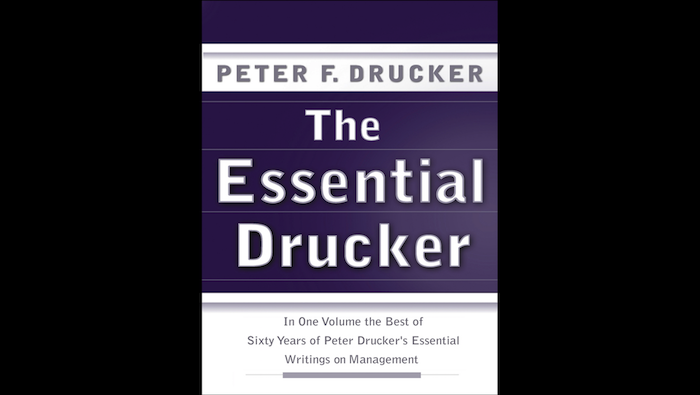 “The Essential Drucker” is organized into 26 chapters, collecting the wisdom and theory of Drucker’s most influential works, from “The Practice of Management” (1954) through “Management Challenges for the 21st Century” (1999). I found it fascinating to explore Drucker’s observations, theories, and recommendations on management. Not only does the book cover a great diversity of management topics, it also covers a great diversity of time and geography. Drucker draws from his experience working with and observing leading manufacturing companies, hospitals, military, and non-profit organizations in the US, Europe, and Japan, to develop and refine his recommendations on management theory and best management practice. Reading the book, it was at times quite obvious that the excerpted material was many decades old. “The Essential Drucker” is already nearly 15 years old, and some of its material is 60 years old. However, I was struck by the realization that, whereas the words and examples were old, the wisdom still rang true and valid. I strongly believe that “The Essential Drucker” presents the best “time-tested” management theory and practice. Though I am also growing older, and hopefully wiser, I do try to keep up with the evolution of technology. With rare exception, I read all of my books on my iPad. I was therefore pleased that “The Essential Drucker” is available as an ebook. This perhaps offers a further contrast, demonstrating that even vintage wisdom can be enjoyed using 21st century technology. One of the best features of ebook readers is the ability to highlight text, create notes and annotations, and then review a summary of notes. I frequently revisit my ebook library, scanning through my book highlights looking for useful information. These notes also come in handy when I write prepare my blog book summaries. In the case of “The Essential Drucker”, I believe I set a new personal record for the average density of page highlights. This book is simply jam-packed with useful information for any manager or executive. To derive maximum personal benefit from Drucker’s 70 years of management wisdom, I have made a personal commitment to revisit this book early next year. I will diligently work my way chapter by chapter, reading each highlighted passage. This will allow me to efficiently and effectively review each topic which I found to be most important and informative. I aspire to periodically revisit Drucker whenever I feel the need to refresh and reinvigorate my management technique, or when I find myself struggling with an operational or leadership challenge. One final comment on the benefit of ebooks: wherever I go, I always carry my iPhone, iPad, and/or MacBook. Drucker is on all three devices. Though Peter Drucker is no longer with us, by leveraging modern technology, I can consult with Drucker at any place or any time.